Check it out! Kickstarter campaign for the new Kauer Guitars acadian – offering T-Shirts, signed albums, and a bunch of other cool stuff for your support! Soon this guitar will go into full production, with a little help from some friends 🙂 There is actually a lot of cool stuff there – not to mention pictures of amazing guitars. CLICK HERE TO CHECK IT OUT! I haven’t had time to post anything recently…not time even to look at comments etc. However I wanted to quickly share this before I have to go back into the cave in a few minutes (a.k.a. the workplace). There is a new community for Luthier’s, and it has a lot of people there to share information, builds, etc. A good place to share your work, to see what others have done, to talk about techniques and tools, etc. – click on the image below to visit and make an account. Back to the cave now. More progress – this is nearing completion now finally. 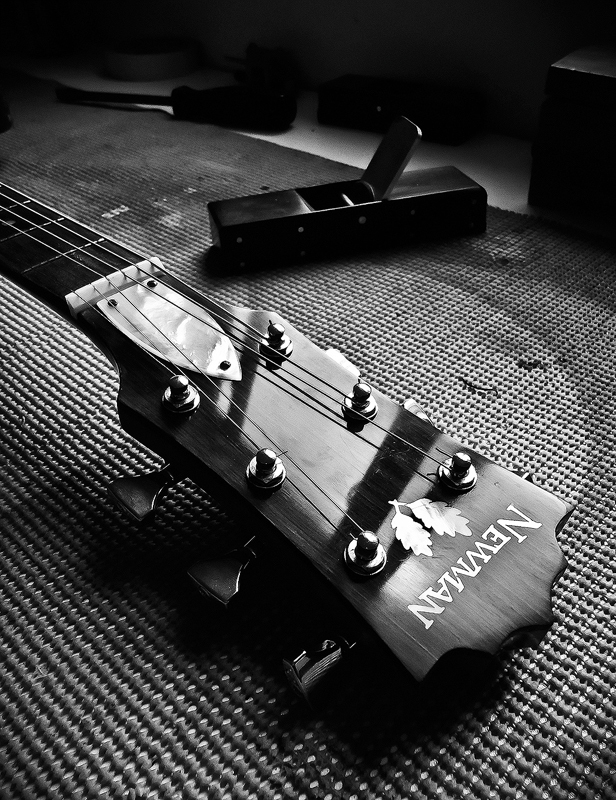 My fret saw is broken – so I had to order a fretboard from StewMac. Can’t say I was thrilled with how thin it was, but it worked out OK for this. The nut is 40 mm. I know some of the old Fender guitars were 40 mm at the nut – it’s comfortable to me (the one I play now is 39 mm) but I’m not sure whether to keep this one for myself or not yet. MOP dots are in, I haven’t glued it on yet. I could widen it to 42 or 43 mm but that would require adding binding. Pickguard – this one I salvaged from another build. I’m going to make a new one for that build. This one is wired with two gold humbuckers, master volume and tone, and a Bourns blend pot. Fretboard will extend to cover the tenon. Used the dremel for the truss rod access. Two way allied-luth truss rod, I prefer those ones. Need to plane this flat to clean it up a bit but it turned out OK.
Drywall finally finished, painted, etc. – power is up. So it’s finished – the new shop is ready to go. Just need another workbench in there. New header! I figured it was time – and since it’s spring now, it might as well have some color (rather than the usual black and white). I’ll switch back to monochromatic when winter comes round again. Also, another plane is almost complete. 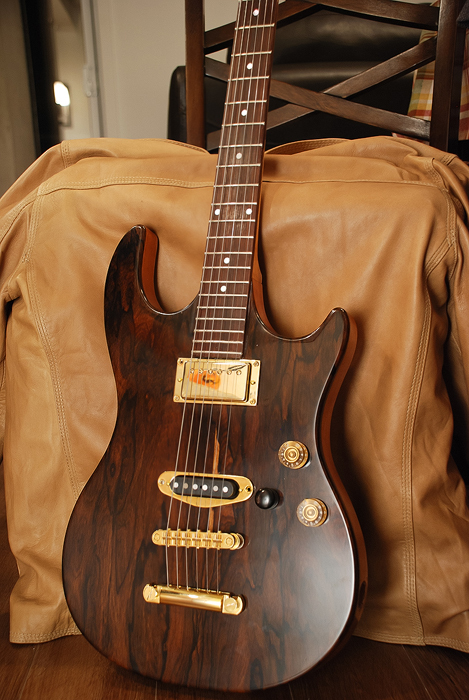 This one is also Cocobolo – however the wedge is Madagascar Rosewood, which is much harder than the Cocobolo. My hope is that it will wear better, I was concerned about how the Cocobolo would hold up over time. In the future however I’m hoping that these planes will be entirely made from a harder wood – in particular I’m hoping I can make them with Ebony or Ziricote, but I’ll have to see what’s available to me (and what’s affordable). Another handplane is in progress. I think this one will turn out to the be the nicest one yet when it’s finished. Tomorrow I will polish the sides to a high gloss. Shout-Out to Canadian (and other) Visitors Here! 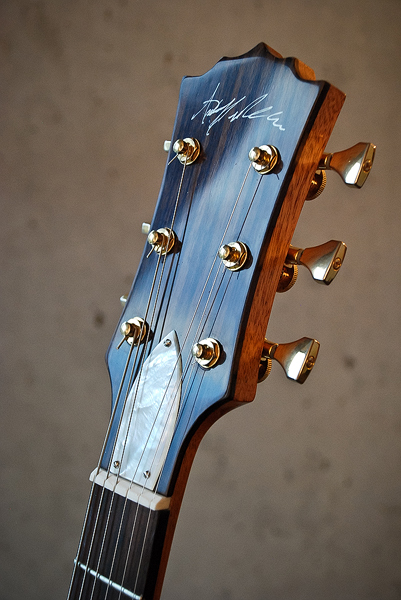 This is a shout-out to all Canadian instrument builders who happen to visit this blog! Specifically those from Ontario (but also to those all over the world if you are interested in an Online community for instrument-building). Whether you be the talented (or not-so talented and wanting to learn) weekend warrior or a professional instrument builder, there is a community being started for Luthiers of Southern Ontario – the forum is open to everyone wherever you be from in the world, however the in-person meetings will be held in Southern Ontario, most likely within the Greater Toronto Area. This website is a place where you can share your work, view other peoples’ work, have discussions about anything lutherie-related, get ideas and feedback, ask questions…etc. In order to participate in the forum you simply need to register a free account and you can begin having discussions on the forum with other members. There are several members already signed up on the forum and the community is quickly growing. So to anybody who views this – if you are interested in guitar building (or the building of other instruments), this is a great new community where you can go to discuss instrument related endeavors. To visit the forum I’ve added a link below that you can click. That’s it for now – cheers! Having a grand old time making these miniature handplanes…this one has no glue, the sides are held in place with brass pins that are peened so they’re nice and tight and shouldn’t be going anywhere for at least 100 years. The blade is O1 steel, body is Cocobolo. Cuts beautifully. The mouth is about 0.5 mm, quite tight. This one will sell for $80 or so. I also sold the Luthier’s Knife to a guy in the United Kingdom so it’s gone from my shop now. Made a knife for guitar making this week – this one has an O1 Steel Blade and Cocobolo handles w/ brass pins. Right now it’s sharp enough to shave with, and the O1 blade will hold a sharp edge for a really long time. My apologies – I’ve been posted fewer interesting articles lately and more of my own projects. I’ll try to do a lesson on how to make a knife like this in the future, unfortunately I haven’t had the time to dig up interesting things to write about in lutherie for a few weeks now.